A must for those staying in Big Sky! The Family Adventure Card gives a family or group of 4 people, a week of unlimited boat rentals at Lake Levinsky and unlimited use of the climbing wall at Geyser Whitewater. The best deal in town! 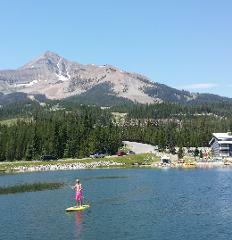 Join us for this fun and educational Stand up Paddle Board adventure on Lake Levinsky. Our staff will meet kids ages 10 to 14 years of age for a 2 hour SUP board experience.